A flea collar is a device used to protect dogs and cats from fleas and ticks. The collar is a plastic strip made by mixing an insecticide with plastic resins and molding the mixture into a thin strip. They are designed to deliver enough pesticide to continually kill fleas for up to 12 months. The pesticide must be safe for prolonged skin contact with animals and non-toxic in the event the animal chews on the collar. The fleas found on dogs (Ctenocephalides canis) and cats (C. felis) are ectoparasites, which live off the blood of their host animal. The adult female flea lays eggs on the animal, or in its sleeping place, which hatch into larvae. These larvae pass through a pupae (or intermediate) stage before entering adulthood. In the course of their normal nine-month life-span, two fleas can produce more than one million offspring. At this rate of reproduction, fleas can easily become a painful annoyance to house pets. They can cause animals to scratch and bite themselves almost constantly. The pets' coats become soiled and roughened and their skin becomes irritated. Dogs in particular may develop severe flea allergies. The need to control these pests is therefore very important to pet owners. Flea control requires killing both the adults and larvae with an insecticide, which can be delivered via sprays, dips, powders, and collars. While collars are somewhat less effective than the other methods because they provide less direct contact, they do offer the long-lasting performance and ease of application. Flea collars are designed to provide animals with effective protection against parasitic infestations. To achieve this goal, both the insecticide composition and the components used to make the collar must be carefully selected. The most important selection criterion is that the insecticide must efficiently kill fleas without being toxic to pets. It must be effective under a variety of environmental conditions, free from significant taste or odor, and non-staining to fur and surfaces such as carpet and furniture that the pet may contact. Other important considerations are related to the plastic components used to manufacture the collar. These must provide the appropriate release characteristics for the chosen active ingredient. Since collars are designed to be worn for three, six, or even 12 months, the plastic must be durable. The type of animal being treated is another factor to consider. Dogs, being larger, require a relatively higher dose of the active ingredient. Cats require about half the dose as that of a dog. Collars are designed to be a standard size, which is approximately 0.375 inch (0.95 cm) wide and 0.125 inch (0.32 cm) thick. They may be made in different lengths to fit different size animals. Collars are deliberately made slightly longer than necessary to allow the pet owner to trim the collar with scissors to ensure a perfect fit for their pet. Collars can be designed to deliver insecticide in a solid or liquid form. One patented collar uses a type of insecticide known as a carbamate which can be incorporated into plastic resins in such a way that the carbamate molecules on the collar's surface which are worn away or displaced by contact with the animal fur are replaced by additional carbamate molecules from within the collar. The effect is a continually replenished supply of insecticide at the collar's surface. Another approach is to use a volatile liquid insecticide like Naled (dimethyl 1,2-dibromo-2,2-dichloroethyl phosphate) which is released from the collar as a vapor. Caution must be used in formulating with liquid insecticides as they may be released too quickly and condense on the surface of the collar in small droplets that may be ingested by the animal. In the industry, this droplet formation phenomenon is known as spewing. A variety of materials are approved for use against flea and ticks. One type is based on chemicals known as carbamates. Materials of this type include 2-isopropoxyphenyl N-methyl carbamate, 3-(1-methylbutyl) phenyl N-methyl carbamate, I-napthyl N-isopropyl carbamate, and many others. To provide effective protection, between 3-25% of these materials must be used as a single active or mixture of actives. Other insecticide materials include tetrachorovinphos, which is also known by the trade name Rabon. More accurately this material is 2-chloro-1(2,4,5-trichlorophenyl) vinyl dimethyl phosphate. It is used in commercial brands such as Hartz Mountain. The collar itself is a made from a mixture of plastic resins and resin modifiers. The resins used to make collars must be formulated to have appropriate strength and flexibility so it can withstand the shaping operations without cracking or crumbling. The resin must have the appropriate release characteristics such that the active ingredients can escape at the proper rate, but such other inert ingredients remain in the collar. Resins commonly used in flea collars include polyvinyl chloride, polyacrylate, and polymethacrylate esters. These resins may comprise up to 35-70% by weight of the total mixture. 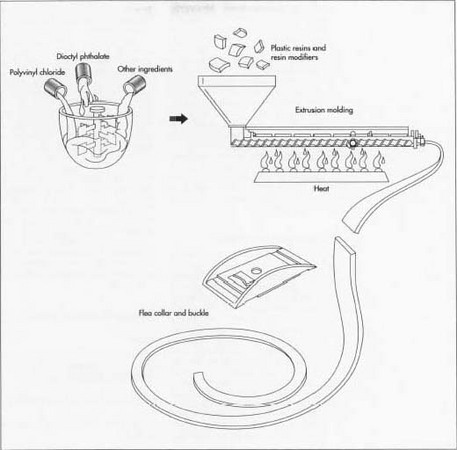 Plasticizers must be incorporated into the mixture to make the plastic resin flexible. If these materials are not added to the formulation, the collar would be brittle and would tend to crack or break during the molding operation. Suitable plasticizers include esters made from phosphoric acid (such as tricresyl phosphate) or phthalic acid (such as dioctyl phthalate). Other useful esters are made from adipic, maleic, myristic, palmitic, or oleic acid. Flea collars also include stabilizers, such antioxidants, which protect the plastic from attack by sunlight and other oxidizing agents. Soybean oil derivatives are useful in this regard. Lubricants, such as stearic acid and low molecular weight polyethylene, are added to improve the physical characteristics of the collar. Inert filler material may also be added to increase the bulk density of the plastic and colorants may be included to give the collar a more pleasing appearance. The closure is typically made from a metal buckle or from a solid piece of plastic. 1 The polyvinyl chloride and dioctyl phthalate are weighed into a mixing kettle equipped with a high speed, high shear mixer such as a Henschel mixer. They are mixed at approximately 1,800 rpm and the soybean oil, and other plastic agents are added. Mixing is continued until the blend is homogeneous. Then the insecticide, stearic acid, and other components are added. Mixing is continued until the mixture is homogenous. 2 The finished mixture is typically shaped by extrusion molding to form a solid fused product in the desired shape. The plastic enters the extruder through a hopper, which feeds it into a long heated barrel. A screw mechanism pushes the plastic forward toward a die at the end of the machine. The molten plastic is forced through the die at approximately 300° F (149° C) and exits as a flat ribbon. The insecticide mixture is mixed with the plastic resins and then the collar is formed through a process called injection molding. ingredients and prolongs the shelf life of the collar. Lastly, they are placed in cardboard boxes and packed for shipping. Individual boxes may be marked with lot numbers as required by Environmental Protection Agency (EPA) regulations. Depending on the quality control procedures of the manufacturer, a number of collars may be selected for testing to ensure they are functioning properly. Collars can be tested by intentionally infesting a dog with a known number of fleas, usually 50-100. The test collar is then attached to the dog and the animal is placed in a paper-lined wire cage. After 48 hours, the dead fleas, which have collected on the paper, are counted. The collar is removed and the dog is doused with an aerosol insecticide, which should kill the remaining fleas. This is confirmed after six hours by counting the additional dead insects. The animal is then washed and re-impregnated with more fleas and the process is repeated several times over 13 weeks. The pesticidal efficiency of the collar is measured as a percentage of fleas killed by the collar versus those killed by the aerosol treatment. An effective collar will kill at least 75% as many fleas as the aerosol treatment. Since insecticides are regulated by the EPA, flea collars require EPA registration. Every formula requires testing to ensure specific requirements for safety and performance are met. Furthermore, the EPA mandates that certain information appears on the package. For example, all product labels are required to have appropriate storage instructions. Factors, which must be considered in establishing storage conditions, include conditions that might alter the composition or usefulness of the pesticide (e.g., extreme heat or humidity). Since collars use EPA-registered biocidal agents, all waste materials must be processed in accordance with EPA regulations. Such waste may be considered biohazardous and will require special handling and disposal techniques. The disposal techniques for empty containers depend on the type of material. For example, metal containers (non-aerosol) must be triple rinsed before recycling or reconditioning. Glass containers must also be triple rinsed and disposed of in a sanitary landfill or by other approved state and local procedures. Paper and plastic bags must be disposed of in a sanitary landfill or by incineration. Fiber drums with liners must be emptied completely and disposed in a sanitary landfill or by incineration if allowed by state and local authorities. Future improvements are likely to come from the development of improved compounds for insect control. For example, one area of current research is focused on finding nonpoisonous ways of controlling fleas. Compounds known as Insect Growth Regulators (IGRs) offer one way to control the population without dangerous side effects. These are hormones, which affect the egg and larva of the flea and make them unable to mature. Therefore, the fleas cannot reproduce. IGRs only affect insects, which go through a four-stage reproductive life cycle. They do not kill the adult flea and must be used in combination with more aggressive pesticides such as the carbamates. They are also non-staining and are practically odor free. Other improvements may come in the design and manufacturing process of the collar. One novel collar design features interlocking pieces which link together to form a continuous band. This method allows collars to uniquely incorporate colors and letters into their design. Another interesting approach involves a kit, which allows the pet owner to add additional liquid insecticide to a refillable collar. Novel designs such as these may hold a place in the future of flea collars. United States Patent 3852416 "Tick and Flea Collar of Solid Solution Plasticized Vinylic Resin-Carbamate Insecticide." United States Patent 4044725 "Pet Collar." United States Patent #D264260 "Flea Collar Buckle." U.S. Department of Agriculture Bulletin on Fleas, February 1997.
our dogs love to cool off in the pool....are the flea collars waterproof, or will they lose their effectiveness when wet?